The Socialist Party (PS) government is launching a violent crackdown on protests that have spread across France against the police murder of Rémi Fraisse, a 21-year-old ecological activist, at a protest against the building of a dam at Sivens in the Tarn area of southern France on October 26. Fraisse, a peaceful protester, was killed on the sidelines of clashes in the early morning between police and members of the reactionary Black Bloc anarchist group, which is heavily penetrated by police provocateurs and regularly stages battles with police. While Interior Minister Bernard Cazeneuve immediately accused protesters of “exploiting” Fraisse’s death, autopsy results showed that Fraisse was killed by fragments of a concussion grenade fired by riot police. Protests rapidly spread against the murder of Fraisse and the PS government’s use of deadly weapons against unarmed protesters. They were met by escalating repression by police. Though Cazeneuve announced an end to the use of concussion grenades against protesters amid calls for his resignation, police are continuing to deploy deadly weapons and overwhelming force at protests against the killing of Fraisse. Cazeneuve has not suspended the policeman who fired the grenade at Fraisse. On November 1, riot police attacked protests in Dijon, Nantes and Toulouse. Six people were wounded in Nantes, including three protesters beaten and injured by grenade fragments, a policeman who suffered acid burns to the hand, and one protester whose nose was torn off by a rubber bullet shot to the head. 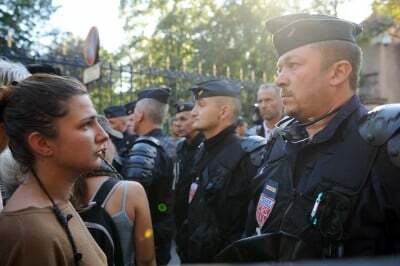 Thirteen people were arrested in Toulouse and 21 in Nantes. On Sunday, thousands of riot police were mobilized in Paris for a crackdown and mass arrests at a protest at Stalingrad Square that was banned by the PS government. Approximately 300 people defied the ban. Ultimately, police arrested 78 people. Pseudo-left groups supporting the PS backed an alternate, legal demonstration in Paris, where a few hundred people gathered near the Eiffel Tower. The Pabloite New Anti-capitalist Party (NPA), which had originally called for protesters to join the Stalingrad protest, joined the Eiffel Tower protest instead. There, its members rubbed shoulders with Left Front leader Jean-Luc Mélenchon and the ex-Pabloite and former Le Monde editor Edwy Plenel. Europe-Ecology-The Greens (EELV) officials posted statements on their Twitter feeds criticizing the protests as violent, though EELV leader and former PS government minister Cécile Duflot had initially laid blame for the killing partially on Prime Minister Manuel Valls. “In September, the prime minister went to the Tarn region to say ‘We held on at Sivens,’ with a martial tone and his usual capacity to overplay his authority. I think this statement by Manuel Valls, while experts were still working on a report, made the situation more tense,” she told Le Monde . The police murder of Fraisse and the PS’s savage crackdown on the ensuing protests testify to the advanced state of decay of French democracy. Discredited and unpopular due to its wars and attacks on workers’ living standards, the PS government has resorted to law-and-order rhetoric and cultivated the police as its social base, with President François Hollande naming Valls, a former interior minister, as prime minister in April. Over the past year, Hollande has predictably kept sinking to historically unprecedented levels of unpopularity. A poll this summer found that Hollande had only 13 percent approval ratings. Now, with 5 million Frenchmen unemployed or underemployed, an Odaxa poll found that only 3 percent of the population supports his jobs policy; 71 percent of the population wants Hollande to leave office before his term expires in 2017. The bans against protests against Fraisse’s murder comes after Hollande banned protests this summer against Israel’s brutal assault on Gaza that killed more than 2,000 Palestinians. The French ruling class is proving utterly bankrupt. As popular discontent now mounts with police brutality, the PS has nothing to offer but a policy of crushing protests outright through bans, violent crackdowns and mass arrests. Above all, these events testify to the politically reactionary role of the pseudo-left parties who supported Hollande’s election in 2012, calling for a PS vote in the run-off against the right-wing incumbent, Nicolas Sarkozy. Mélenchon and the NPA justified their support for the reactionary Hollande administration by claiming it would be easier to “pressure” Hollande with street protests in order to compel him to carry out “left” policies (see “France’s New Anti-capitalist Party backs Socialist Party candidate in May 6 run-off”). This was a political lie. It is now widely recognized that Hollande’s policies are even more savagely reactionary than those of Sarkozy, while the pseudo-left forces and allied union officials—having done nothing to mobilize the working class against the PS—are now scheduling their pro forma protests in line with the demands of Valls’s police.